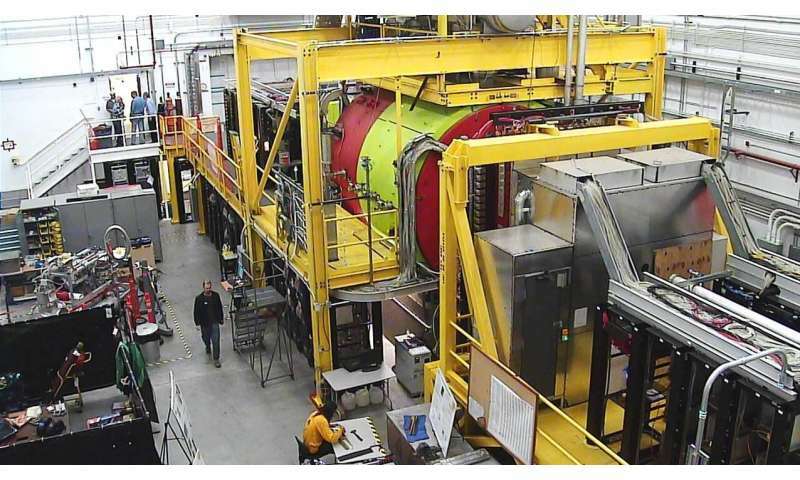 An experiment that aims to gain new insight into the force that binds all matter together has recently completed its first phase of data collection at the U.S. Department of Energy's Thomas Jefferson National Accelerator Facility. The Gluonic Excitations Experiment, or GlueX, is designed to produce and study hybrid mesons, which are particles that are built of the same stuff as ordinary protons and neutrons: quarks bound together by the "glue" of the strong force. But unlike ordinary mesons, the glue in hybrid mesons behaves differently by actively contributing to the particles' properties. "A meson is a quark and antiquark bound together. Our understanding is that the glue holds those together, and that glue manifests itself as a field between the quarks. A hybrid meson is one with that strong gluonic field being excited," said Curtis Meyer, a professor of physics at Carnegie Mellon University and spokesperson for the GlueX experiment. Catching a glimpse of the strong force's overt action in hybrid mesons will offer nuclear physicists a new perspective on how subatomic particles are built by the strong force. It also offers a unique opportunity to explore "quark confinement—why no quark has ever been found alone. The first phase of this experiment was completed successfully at the end of November. It began in 2016 and has completed four run periods, collecting more than four petabytes of data for analysis. "Up until now, data from the first two of these, which is about 20 percent of all data, have been analyzed," Meyer said. He said that no hybrid mesons have yet been identified in the data—though such a result is not surprising at this stage of the analysis. The GlueX experiment was designed to produce the spectrum of mesons, including hybrid mesons, for study to learn more about quark confinement and the strong force's role in this phenomenon. In the current analysis, the collaboration has already identified several other members of the meson spectrum that they expected to see. "And the early physics results have already been communicated to the community in one journal paper and many conference presentations," Meyer said. More publications are in the final review states and are expected to appear in 2019. In addition, Meyer said that the GlueX collaboration is looking forward to conducting its research with the entire data set from the first phase, a goal that has been two decades in the making. "I'm stunned. We've been working on getting to this point for more than 20 years, and now we finally have the first round of data," said Meyer. "Now, we're working on data analysis to see what we can learn." The next phase of GlueX is expected to start up in the fall of 2019. In that phase, an additional detector system, called the GlueX DIRC, for Detection of Internally Reflected Cherenkov light detector, is being installed to upgrade the experiment's capability to positively identify different types of mesons by the flavors of quarks they contain. The experiment was made possible by the recently completed 12 GeV Upgrade of the laboratory's Continuous Electron Beam Accelerator Facility, a DOE Office of Science User Facility for nuclear physics. The 12 GeV CEBAF Upgrade was a $338 million, multi-year project to triple CEBAF's original operational energy for investigating the quark structure of the atom's nucleus. The upgrade was completed in 2017 and dedicated earlier this year.